The gala Port of Colombo Awards Night organized by Sri Lanka Ports Authority (SLPA) in collaboration with the Jaya Container Terminal (JCT), South Asia Gateway Terminals (SAGT) and the Colombo International Container Terminals(CICT) for the first time, was held on Monday 23rd July 2018 at 06.00pm at the Shangri-La Hotel, Colombo. Hon.Minister of Ports and Shipping Mahinda Samarasinghe attended the Chief Guest of the event accompanied with the Chairman of Sri Lanka Ports Authority (SLPA) Dr.Parakrama Dissanayake, Mr.Romesh David – Chief Executive Officer of the South Asia Gateway Terminals ltd; and Mr.Jack Huang – Chief Executive Officer of the Colombo International Terminals Ltd. The Awards Night was also attended by more than 30 top level foreign delegates of Shipping Lines calling the Port of Colombo and a large number of high profile maritime industry leaders in both local and international level. 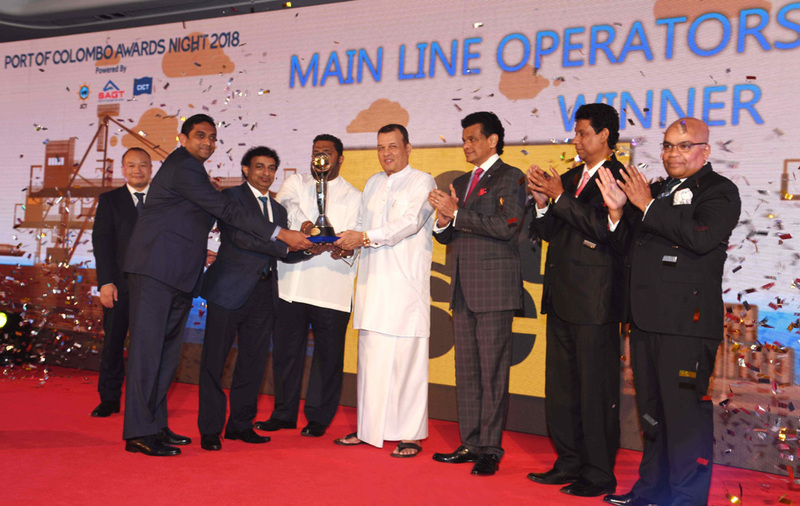 Amongst Ten nominees for the Main Lines, the Mediterranean Shipping Company was awarded the most outstanding Main Line Operator to the Port of Colombo. Maersk Line was awarded the second, CMA CGM the third, Evergreen Line the fourth and Hapag-Lloyd the fifth. The selection criteria for these awards for the Main Lines was identified through the total box operator container throughput in TEUs of Port of Colombo for all three container terminals. Amongst eight Feeder Operators to the Port of Colombo, the top feeder operator was awarded to the X-Press Feeders. Bengal Tiger Line Pte. Ltd, FAR Shipping Singapore PTE.Ltd, Transworld Feeders FZCO and Orient Express Lines (Singapore) Pte Limited were awarded from second to fifth best feeder operator awards respectively. 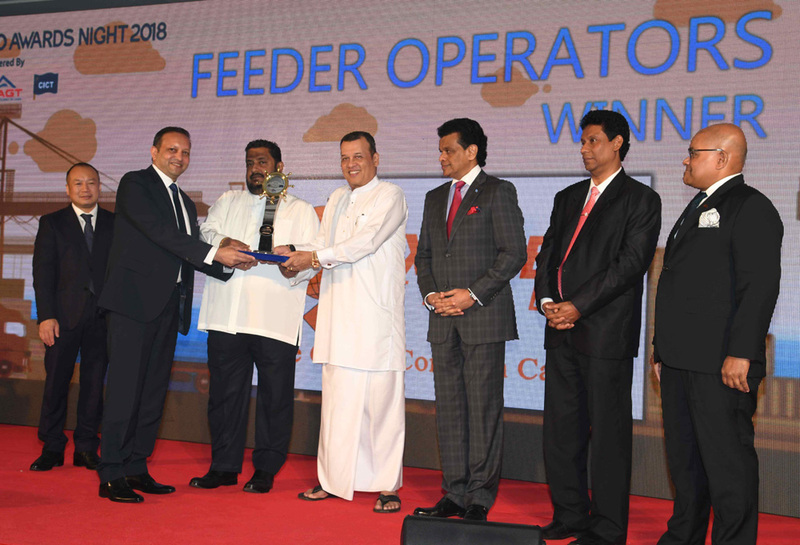 The selection criteria for the best feeder operator award was identified through their total Container Throughput handled at all three terminals of the Port of Colombo. Expressing views at the occasion, Hon.Minister of Ports and Shipping Mahinda Samarasinghe highly appreciated the joint efforts of the Jaya Container Terminal (JCT) of Sri Lanka Ports Authority (SLPA), the South Asia Gateway Terminals (SAGT) and the Colombo International Container Terminals (CICT). “Sri Lanka was the first country in South Asia to adopt an open economic model for free enterprise system many years ago. As a government of national unity our vision is to work with every friendly nation. Of course our closest neighboring countries in the region are very special to us. We always encourage these friendly nations inviting them to accelerate our development to a sustainable growth,” the Minister stated. He also said that it was in such background, the Port of Colombo was offering with continued stability to patronize its terminals for all stakeholders. The Minister emphasized that the East Container Terminal of the Port of Colombo will be shortly operationalised by Sri Lanka Ports Authority(SLPA). “We are not looking for a Public Private Partnership for the East Container Terminal. We have invested nearly US $ 100 million in building up the infrastructure of the East Container Terminal up to now,” he stated. The Minister also declared that the West Container Terminal of the Port of Colombo will be developed on a Public Private Partnership basis as another deep water harbour facility and had also embarked on a feasibility study to be done in Colombo North Port. The Chairman of Sri Lanka Ports Authority (SLPA) Dr.Parakrama Dissanayake welcoming the distinguish gathering at the event said that the historic Port of Colombo Awards Night stemmed out of the framework agreement that was signed recently on the advice of the Honorable Minister between the JCT, SAGT and CICT to collaboratively elevate the Port of Colombo. “ It is about the growth and progression of the Port of Colombo as we are meeting amidst some challenging times. Despite such challenges, during the first half of 2018 as against the first half of 2017, the Port of Colombo has witnessed a transshipment growth of 19.8% and this is only because of the untiring efforts and service levels of all three terminals, the JCT, SAGT and CICT,” Dr.Dissanayake said. At present, 22 Main Lines and 08 Feeder Services are engaged with the Port of Colombo for container operations. The Port of Colombo Awards 2018 will evaluate their invaluable service to increase the volumes of the port in its course to make Sri Lanka the Mega hub of the region. According to internationally recognized global ranking indexes, the Port of Colombo is positioned as the world’s 23rd best container port and the 13th best connectivity port in the world at present.